KNIFE KING Baby Blue is an absolutely gorgeous knife. 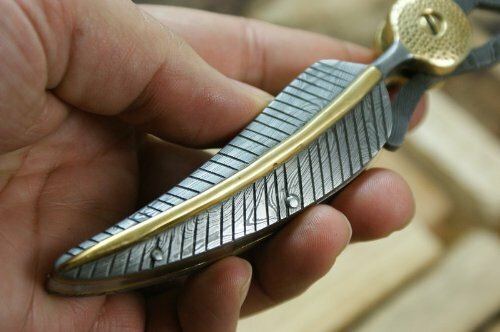 Unique knife with impressive quality. It’s unusual, fits well in steampunk, historical, or macabre motifs. 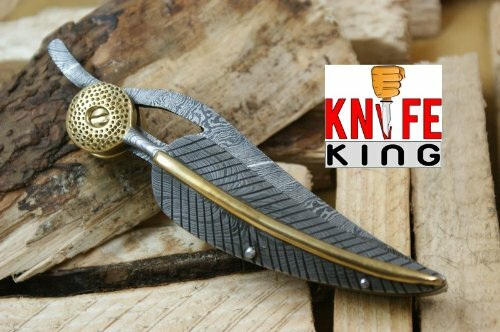 The blade comes very sharpe due to the hardness of the Damascus steel, you could do surgery with this baby! KNIFE KING Baby Blue is an absolutely gorgeous knife. 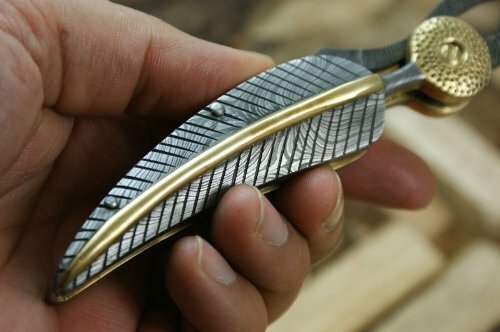 Unique knife with impressive quality. It’s unusual, fits well in steampunk, historical, or macabre motifs. 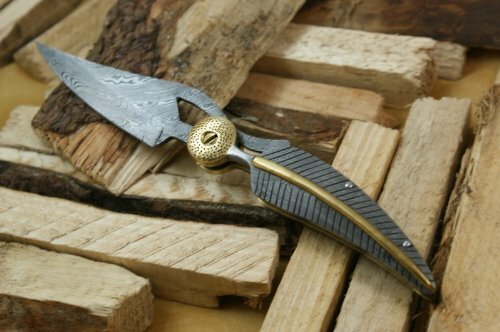 The blade comes very sharpe due to the hardness of the Damascus steel, you could do surgery with this baby! Truly a collector’s piece. 7) It’s exactly what the picture shows. 3) Size of knife vs size of blade. Very heavy, sturdy, solid and sharp enough to split a shadow. 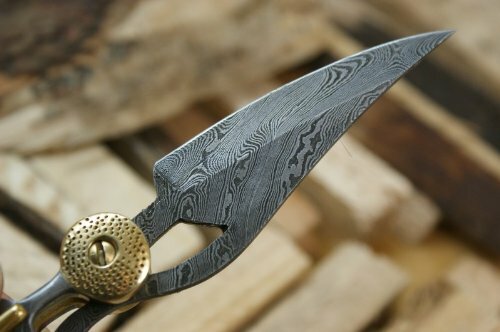 Ok first off I took time to read some of the long winded reviews of some of the self claimed knife enthusiast claiming that this knife is fake damascus. I doubt if any who made these claims have the means to test the true quality of this steel. With that said the first way would be to look at the spine of the (blade) with a magnifying glass under good light in order to check for layering and small imperfections which would appear to be little cracks. 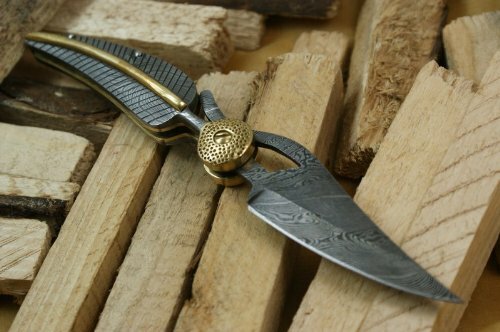 This knife have all of these characteristics which would suggest that it is true damascus the leaf parts of the handle also carry these traights. The center spine of the handle which has been brushed and carvings could not be determined as it would require taking the knife apart. Most fakes and laser eched would have no need to be delivered oiled and rapped in plastic. I think it’s safe to say that this knife is true damascus steel. Blade: 3.5 inch handle 4.75 inch. 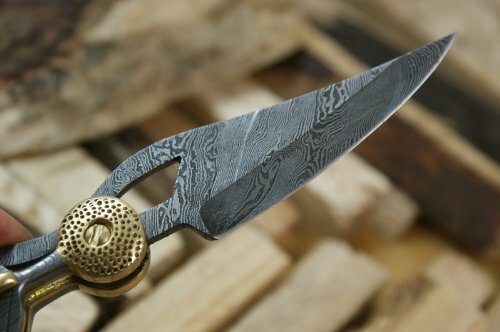 Quality Material Used 15N25 & 1075 Over 200 layers of damascus steel.